Massage Lotions: Which One Is The Best For You? When it comes to pro-quality massage lotions, every therapist has his or her preferences. The sheer abundance and variety, however, can be more than a little daunting for the first-time buyer, which is why we’ve reviewed 7 of the top ranking massage lotions on the market today. Whether you’re looking for optimum grip or a more oil-like glide, scented or unscented, or alternately need a product targeted towards a specific concern, the best massage lotion is right at your fingertips. And with so many of the most popular brands containing all organic ingredients, zero parabens, and a cruelty-free message, you can rest easy knowing your money and skills are promoting a more ethical, natural way of healing. A leader in quality massage products since 1980, Biotone has earned a trusted name for itself thanks to its use of skin-friendly organic ingredients and extensive range of textures designed to suit every therapist’s technique of choice. Biotone’s Advanced Therapy Lotion is famed for its unscented, hypoallergenic, paraben-free formula and subsequently gentle drag, with many users reporting minimal to no reapplications necessary, despite its deceptively easy absorption. Perfect for those with scent sensitivities and/or skin conditions, Biotone Advanced Therapy Lotion boasts optimal skin and muscle manipulation in a long lasting performance that leaves no greasy residue behind. Additional apricot, coconut, grape seed, and sesame oils leave the skin softened and moisturized, minus the overwhelming scent so many find off-putting in massage products. Packed with essential oils such as eucalyptus, wintergreen, and clove, Nature’s Sunshine Tei-Fu lotion provides all the benefits of a massage oil with the control of a more traditional lotion. Easy to apply and with improved stability thanks to its tube packaging, Nature’s Sunshine Tei-Fu massage lotion leaves the skin smooth and supple, with a pleasantly refreshing after scent. 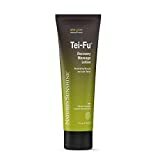 Formulated for broad skin application, Nature’s Sunshine Tei-Fu lotion’s organic ingredients ensure deep relief for stiff joints and muscles, with online reviews praising it for its pain relieving properties. The added benefit of camphor means even faster-acting pain relief, and according to customer feedback a little bit of Tei-Fu lotion goes a very long way, making it a potent and cost-effective addition to your massage regimen. Lavender has been proven effective in relieving stress, while providing equally powerful relief to sore muscles and stiff joints. Peppermint oil also helps to lessen the pain in achy joints, as well as loosen up tight muscles. 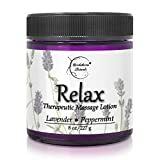 Brookethorne Naturals’ Relax lotion also contains sweet almond, jojoba, avocado, and marjoram oils, the latter carrying especially powerful antispasmodic and analgesic properties known for reducing pain related to muscular overexertion, as well as muscle cramping. Ideal for muscle or deep tissue therapy, Relax lotion is paraben-free and 60% organic. 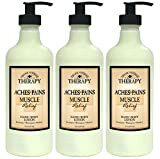 Cooling eucalyptus, menthol, and wintergreen extracts and essential oils make Village Naturals’ Therapy Muscle Relief Natural lotion a go-to for those suffering from reoccurring aches and pains. This deep penetrating formula is enriched with vitamins and naturally derived skin softeners such as shea butter and aloe, both of which are guaranteed to nourish and improve the circulation, texture, and appearance of the skin. Many users have praised Village Naturals’ products as ideal for those suffering from sports-related as well as arthritic pains, and all manner of discomforts besides. It’s no surprise that given its attractive packaging and appealing array of scents, Village Naturals massage lotions are cited as perfect gifts for fellow therapists. Starting as a small family-owned company, La Palm quickly expanded to wide international popularity, with products featured in spas and salons around the world. With its sweetly cheerful scent and luxuriously crafted formula, La Palm’s Organic Healing Therapy massage lotion in zesty tangerine-orange is perfect for those looking for an unforgettable sensory boost to accompany their massage. Packed with aloe vera and vitamin E, as well as added sesame and eucalyptus oils, Organic Healing Therapy lotion provides long lasting hydration with a pleasingly silky texture. Ideal for all-over massages including the hands and feet, this rejuvenating massage lotion is absorbed quickly into the skin while allowing for continually smooth therapeutic manipulation. With their rich texture and equally sumptuous scents, La Palm’s massage products are made with luxury experiences in mind. If you’re looking to provide your client with an uplifting aromatic sensation, this may just be the lotion you–and your clients–have been waiting for. Founded in Los Angeles in 1977 and now operating out of New Mexico, the family-owned Soothing Touch company has produced some of the most trusted products in massage therapy, with their unscented jojoba lotion earning particularly high marks among the massage elite. Containing zero parabens, synthetics, or petroleum, Soothing Touch’s massage lotion is packed with vitamin E-rich herbal infusions such as arnica, aloe, and jojoba for the ultimate–and organic–massage experience. Specially formulated for minimum glide and deeper friction, this deep tissue massage lotion is ideal for stimulating neuromuscular procedures, as well as providing relief from knotted muscles and trigger points. While the lotion notably starts out with a slippery, more oil-like texture, therapists report a satisfying skin absorption and controlled glide. Its non-greasy texture means Biotone’s deep tissue massage lotion gives you complete control and maximum friction, with none of the tackiness or drag of less products, users praise this lotion for its unscented formula that starts out as an oil and dries to a superior workable lotion. The luscious addition of Hawaiian kukui nut, almond, and pecan oils leaves skin impossibly pampered and healthy, with no tacky residue or grease-stained fabrics. And just like its companion Advanced Therapy lotion, Biotone’s deep tissue massage lotion is also unscented, hypoallergenic, and paraben-free. When selecting the right massage lotion, it’s important to determine what will best work for your client, as well as meet your own professional and personal standards. Cost and consistency are also worth examining, as no doubt you’ve come to learn that the priciest massage products don’t always deliver on their upscale promises. Whether you’re looking for a massage lotion that provides optimal grip or a more oil-like spread, boasts an intoxicating scent or is conversely scent-free, the above massage lotions have all been rated by massage professionals and their clients as among the best. Not only that, but thanks to the majority of the listed items almost unanimously organic and cruelty-free, you can trust that the products you’re using are as safe and ethical as they are high in quality.